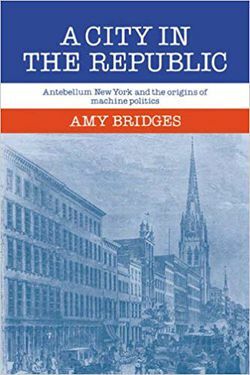 Published in 1984, Amy Bridges’ A City in the Republic and Sean Wilentz’s Chants Democratic each explore the creation of working-class consciousness in the political life of antebellum New York. However, though the works overlap and draw similar conclusions regarding several aspects of eighteenth-century New York, they do so from different vantage points. Chants Democratic asserts that beginning with the market and transportation revolutions of the 1800s (notably the completion of the Erie Canal which helped to cement New York’s position as one of the premier manufacturing centers in the world) altered the relationships between journeymen and master artisans. New York’s unique blend of small scale but intensive and proliferating industry, employed people in a wide variety of crafts, each with their own interests. By the 1820s, many masters had begun subdividing labor, meaning they were farming labor out for homework or separate artisans. This violated the artisanal craft structure. If masters no longer took on apprentices and journeymen then fewer journeymen could become masters. Even small masters struggled to keep up with the changing economy, as evidenced by their lack of property. Larger masters embraced, gradually, the laissez-faire entrepreneurial opportunities of the time slowly turning away from their previously close relations to craftsmen. Economic changes that lowered wages encouraging journeymen to lodge complaints. The gap widened between the two groups until nearly all connections severed under the heat of trade unionism in the 1830s and later 1850s. However, though this political belief or identity provided some sense of unity, the diversity of occupations/crafts made organizing difficult. Moreover, the division within the trade as late as the early 1830s was not always self-evident. The presence of small masters both among the larger entrepreneurial class and those that identified with journeymen serves as only one example of the ambiguity in which the trades found themselves. The Working Men’s Movement provided a short-lived venue through which craftsmen and radicals could unite. Significantly affecting the 1829 elections, the Working Men’s Movement formalized into the Workingmen’s Party. However, its formation alienated most craftsmen from the organization as Owenites and others successfully took over the organization, marginalizing many of the trade unionists who had been central figures in the movement. Still, the movement articulated a belief that Masters and their entrepreneurial spirit threatened the republic. As a popular movement, it briefly enabled craftsmen of various backgrounds to cull coherent rhetoric of republicanism while resisting the economic and political changes endorsed by the “city masters.” The General Trade Union (GTU) followed. Like the Workingmen’s Movement, it too failed. Similarly, craft masters did not sit idly by. They also formulated their republicanism, “the tumults that accompanied the rise of the GTU, the masters’ views on wage labor and the harmony of interests in the trades also sharpened their entrepreneurial republicanism in response to the unionists’ class consciousness. … New York’s craft employers and their allies began to proclaim what labor historians would call an “ideology of free labor.”” (271) Unfortunately, this ideology refused to acknowledge exploitation or the inequalities of opportunity. A bourgeoisie outlook in nature, many masters, developed their class consciousness within the confines of bourgeoisie society. The rise of temperance movements and nativism also impacted working class consciousness. It also provided a cultural dimension to the schism between employers and craftsmen. Temperance found extensive support among the city masters if only because many believed it would improve production and work rates. Workers saw this as an intrusion on their rights of self-possession, drinking served not only as a cultural aspect of craftsmen’s lives but also part their independence. Criticized for its lack of religiosity and its attempt to build a “replica of the Bowery republic, minus drink.” (310) As nativism grew in popularity, many craftsmen gravitated toward its tenets especially because none of the city’s political parties identified with any particular class. Nativists easily occupied this space. With the influx of Irish and German immigrants into the city, native-born craftsmen needed a little prodding in adopting less than gracious attitudes toward newcomers. While many historians have presented Nativism and the Washingtonian movements as irrational responses to anxiety, Wilentz argues each reacted to real fears concerning dependence, a key aspect of artisanal republicanism and class consciousness. Though the Panic of 1837 undermined the efforts on unions and journeymen, trade unionism it persisted as an underground entity. Moreover, individuals such as Mike Walsh continued to advocate for workingmen though his efficacy was undermined after Southern Democrats had co-opted him in Congress. Protective unions and benefit associations emerged as well to support craftsmen and others. Additionally, German and Irish immigrants founded their organizations to represent their views. If some craftsmen remained nativists, they couched their nativist arguments in which immigrant restrictions centered not on cultural differences but as a way to limit “capitalistic greed and underpayment.” By the 1850s, trade union activism no longer provided the only sharp criticism of the status quo. Rather the growth of the land reform, notably through the NRA (some label it a form of petit bourgeoisie radicalism but also helped labor activism) which kept alive a network of radical trade unionists. Though women often emerge as secondary figures in Chants Democratic, Wilentz does note that the trade unions ignored women labor or decried it as demeaning. Still, militant female labor activists did surface in the same period as well. Ultimately, Wilentz argues that by 1850 the city’s population was riven by class, a divide that continued well after the Civil War. Pushing back against earlier conclusions regarding municipal government, Bridges identifies three tropes that she finds questionable. First, ethnicity in the Antebellum age mattered less than historians have argued. Sean Wilentz might even agree with this conclusion because by the 1850s because Irish and German immigrants participated together in 1850 strikes. Then again, he might also disagree since he went to great lengths to illustrate the nativism that affected many journeymen and the labor movement itself. 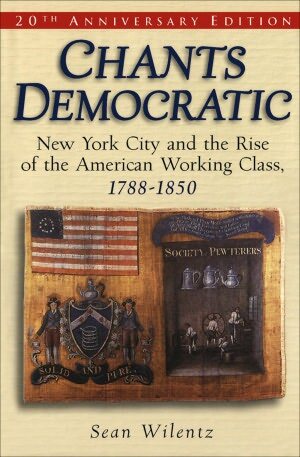 Like Wilentz, Bridges identifies the broad economic changes of antebellum New York City that helped to create the foundation for machine politics. For example, Bridges to notes the growing hostility between masters and journeymen, employers and employee, however, she also explores the effects of the upper classes retreat from public life. The proliferation of city agencies and the professionalization of the police and fire departments gradually removed authority from the city’s upper classes. Volunteer fire departments once featured relative class diversity, but before their professionalization, they had become predominantly working class [wilentz notes this as well]. ' Other aspects of public life endured similar shifts, enabling the political class to build power. As Bridges notes, recipients of local aid probably cared little if support came from wealthy patricians or ward heelers, “In sum, the career politician began where the patrician left off. The friendship for the poor and the workingman that was a hallmark of the persona of the boss was part of the career politician from the beginning.” (74) Moreover, the local artisanal association, community groups, and other smaller organizations created the foundation for ward politics, though the ward already served as the city’s primary political unit. If Wilentz illustrates that the occupational diversity of craftsmen hindered attempts at political unity, Bridges reminds the readers that even “professionals” such as lawyer George Templeton Strong did not necessarily identify with their fellow attorney’s. Class divisions remained. Working men advocates such as the infamous Mike Walsh preceded bosses and the machine system, contributing to its scaffolding. One of Bridges key insights, which she expands upon later in Morning Glories, remains that “reformers” or good government types often wanted to reshape government because they feared/hated the immigrant hordes. One of the primary weaknesses of both Wilentz and Bridges books is the failure to address gender in any great detail. Although Wilentz does mention it in numerous places… still, he fails to delve deeper into this topic. It is highly unlikely that gender played no role in the development of American politics in New York City. Both of these books look at a period that corresponds to the rise of women's social movements and the Second Great Awakening. It is a whiff on the part of both authors.